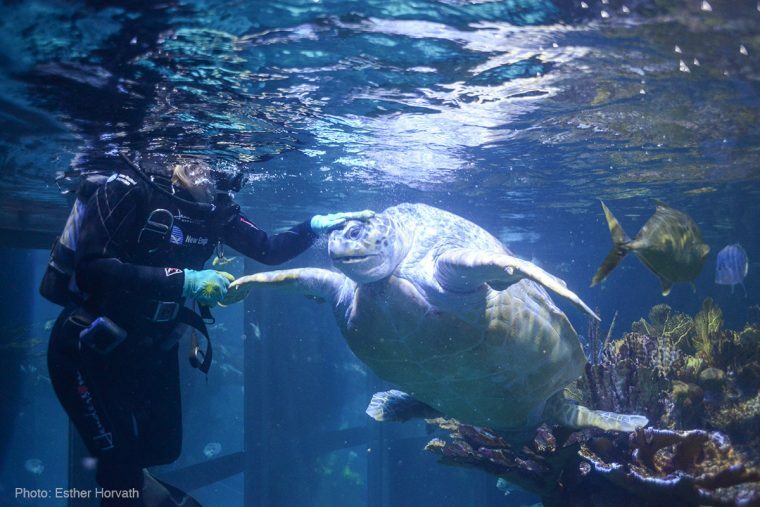 She’s only our most famous resident, a 550-pound reptile familiar to generations of Aquarium visitors. She has graced billboards and TV screens and swum with celebrities even more famous than herself. Researchers have studied her behavior and hearing. Scuba divers know her favorite nap spots, and volunteers know her favorite foods. 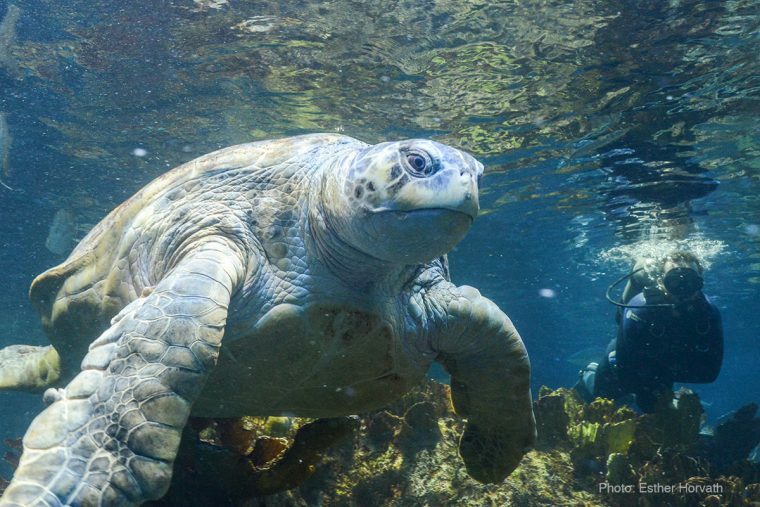 Visitors have been engaging with this lumbering sea turtle ambassador for more than 45 years. 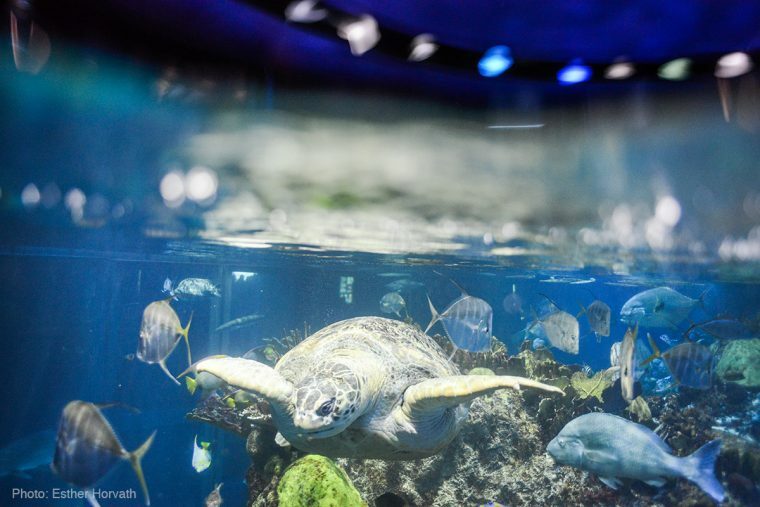 Without a doubt, Myrtle the green sea turtle is the queen of the Giant Ocean Tank. Few people know the queen better than Sherrie Floyd, supervisor of the Giant Ocean Tank. 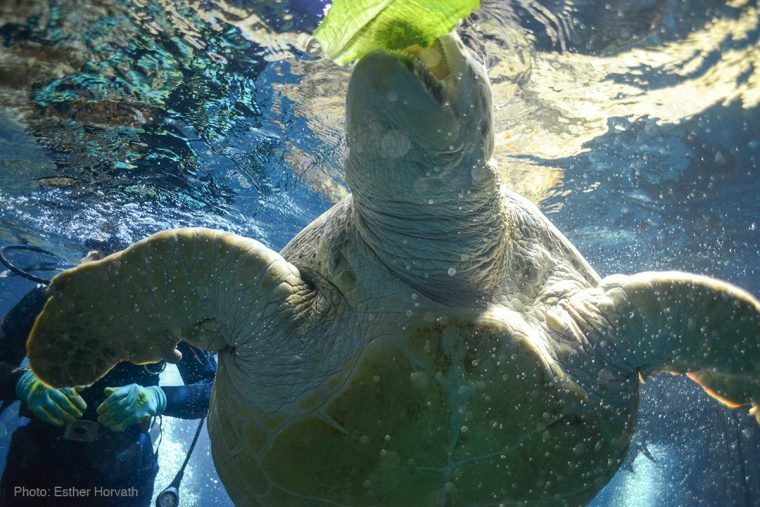 Sherrie and Myrtle have been swimming together for more than 20 years. 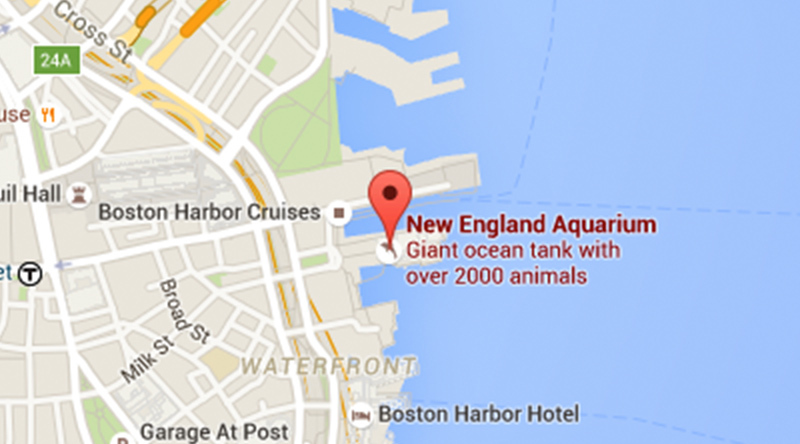 “We know she came from an aquarium in Provincetown, which is no longer there. That was in 1970,” explains Sherrie. 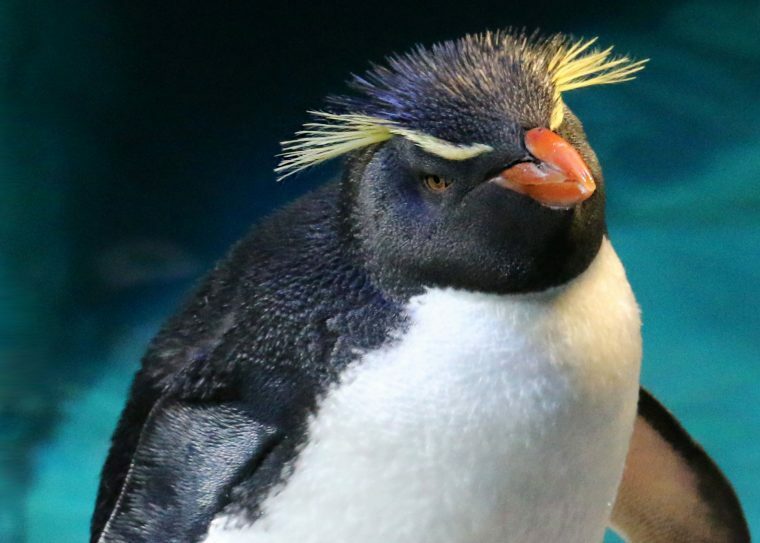 What we don’t know is how Myrtle got to that Cape Cod aquarium in the first place, or how long she was there. 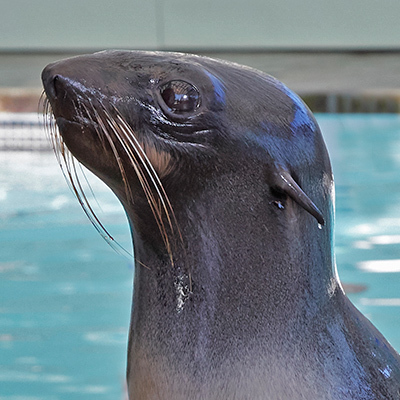 It’s likely she was taken from the ocean before endangered species legislation prohibited taking these animals from the wild (except in cases of animal rescue). But Aquarium records mark the day she arrived, and we have detailed medical records and diet regimes to document her decades on Central Wharf. 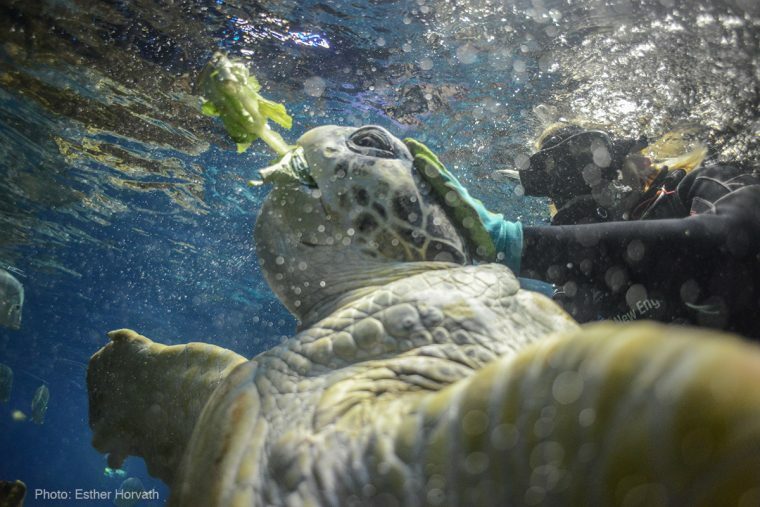 But the divers and vet staff modified her feeding schedule to better reflect that of wild sea turtles. Now Myrtle is fed her lettuce, broccoli, peppers, Brussels’ sprouts and an occasional vitamin-spiked squid from the top of the tank whenever divers are in the exhibit. No more pestering divers, and a feeding schedule that mimics the seagrass-grazing habits of wild turtles. 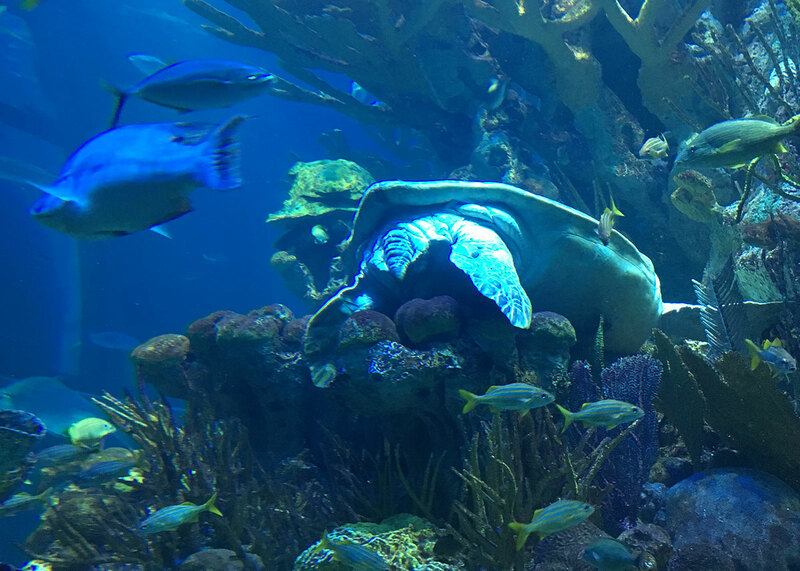 When she’s not being fed, Myrtle can often be found snoozing on the corals about halfway up the spiral of the Giant Ocean Tank. She can hold her breath for up to two hours when resting! Whether she’s sleeping or swimming, the other animals in the exhibit mostly stay out of her way. 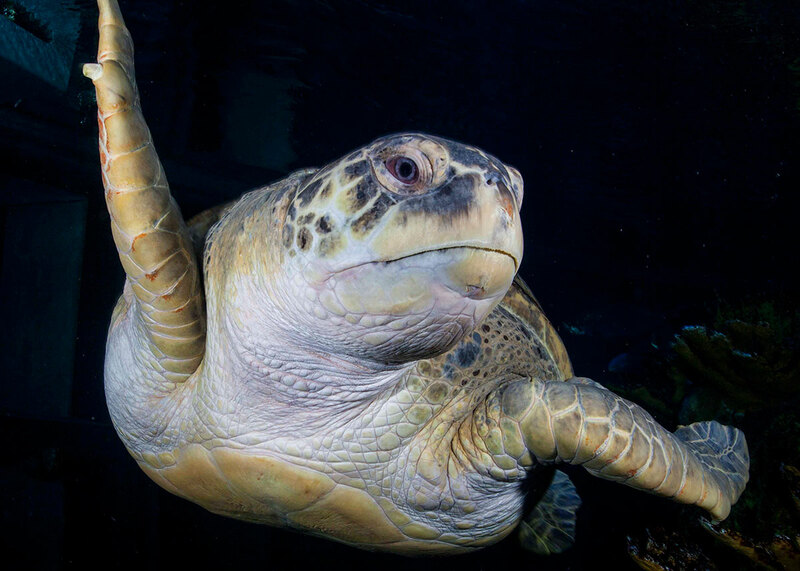 Scientists have a lot to learn about sea turtles in the wild, and our resident green sea turtle is doing her part to teach about the species. 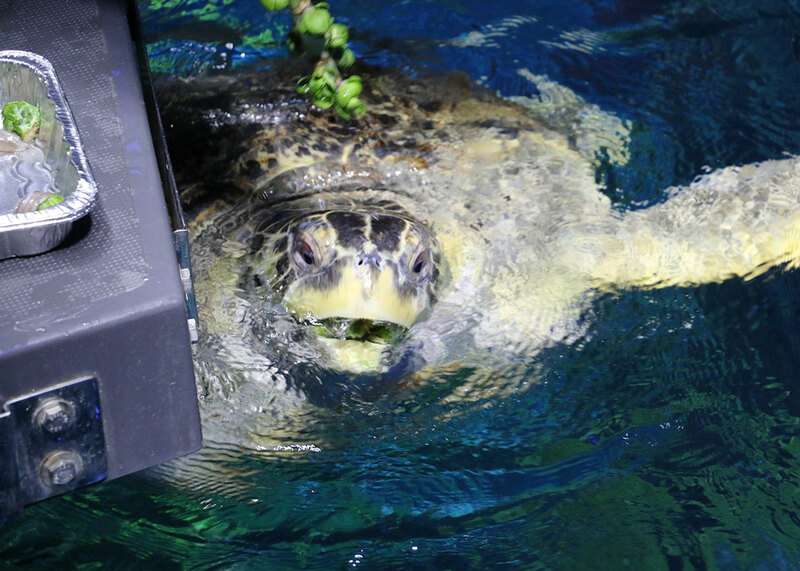 Several years ago, the Aquarium’s trainers developed a target feeding system that tested Myrtle’s hearing. If just a light flashed, she stayed put, hovering in front of the light box. If a light flashed at the same time as a beep, she learned to go to the speaker and touch it with her beak for food reinforcement. It turns out she has the ability to hear sounds and make complex decisions. 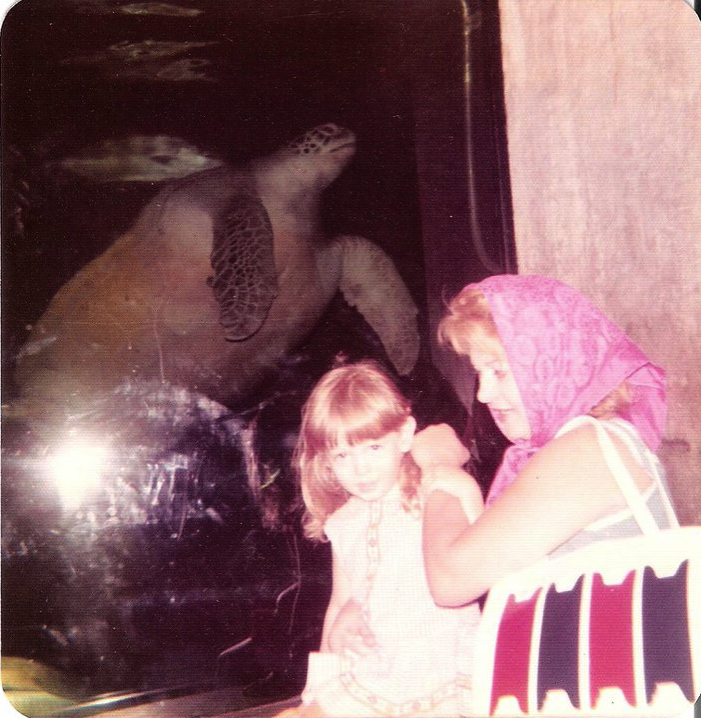 Myrtle has also been teaching visitors about green sea turtles for decades. 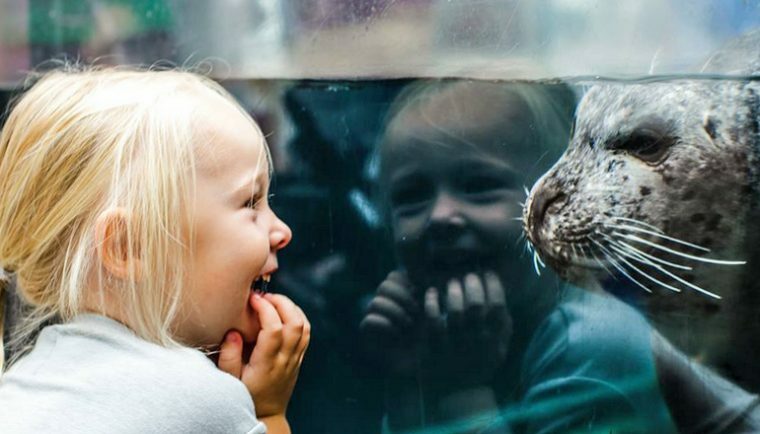 She has been at the Aquarium long enough for generations to fall in love with her. People who first saw her as children are now bringing their own children to see her. “We estimate that she’s around 90 years old now,” says Sherrie. 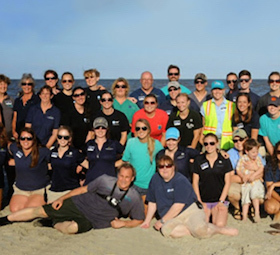 “While we don’t exactly know how long turtles live in the wild, we think Myrtle has many more years ahead of her.” And that’s many more years to enthrall young visitors who may one day bring their own children to see this hulking, charismatic and hungry ambassador for green sea turtles. 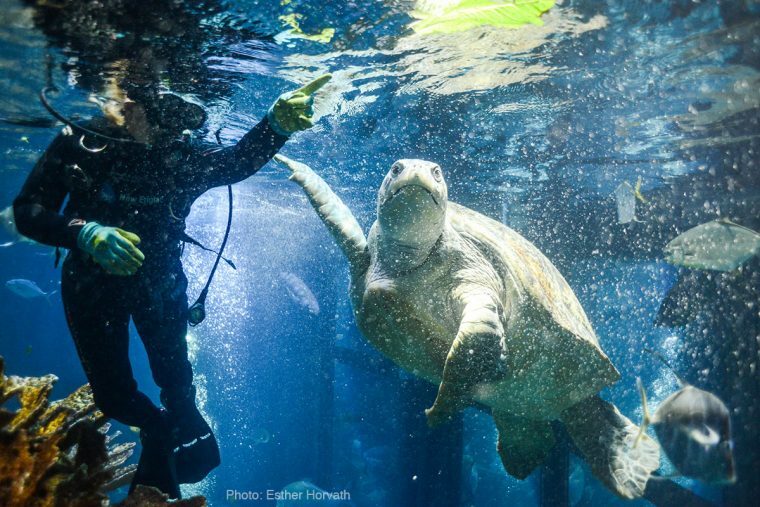 Photographer Esther Horvath photographed Myrtle in the Giant Ocean Tank in 2015. 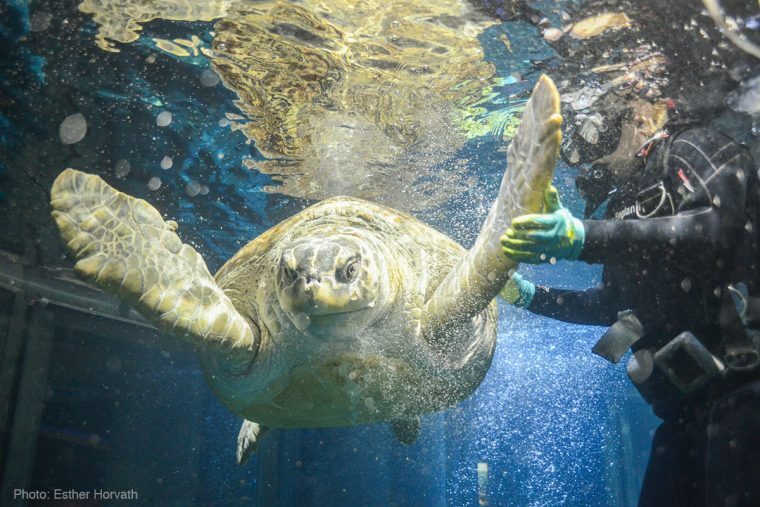 Check out the gorgeous shots of Myrtle and diver Sherrie Floyd!